One of the cool things about using a CSA provider is getting “surprise” veggies you have not cooked previously. A few weeks ago, Kohlrabi showed up in our box. Luckily, she sent this recipe along with them. Kohlrabi are part of the cabbage family, and have an odd sputnik look to them. (OK, that dated me…) Here’s a recipe that not only uses them, but is DELICIOUS! 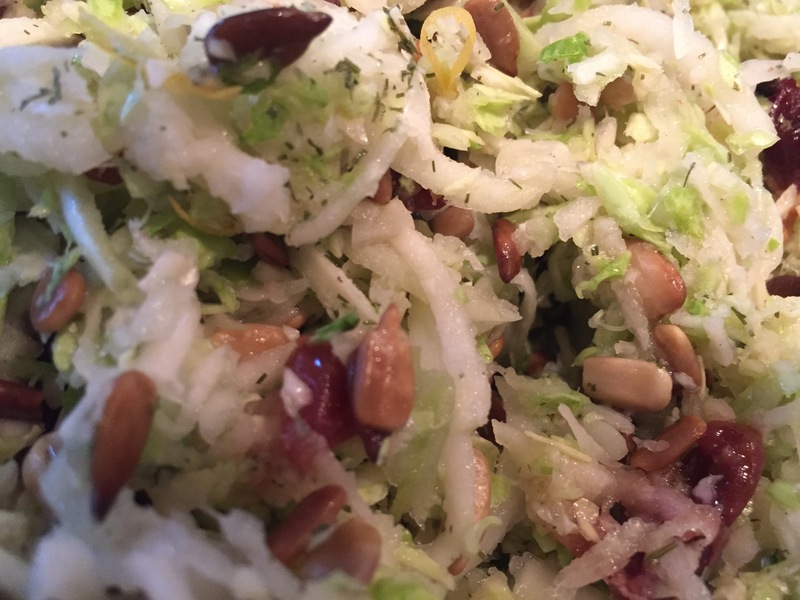 Want a twist on coleslaw? Here it is, but first, a rundown of the benefits of eating Kohlrabi. Low in fat, high in fiber, potassium, and a ton of Vitamin C, and they are in season now! Place 1 tbs. of coconut or avocado oil in a skillet. Sprinkle with salt. Toast the sesame seeds until lightly brown. Remove the long stems from the kohlrabi. Then, trim away the thick green skin until you reach the light green to white part that is free of tough fibers. Shred the kolrabi and the cabbage. I use my food processor, but you can also shred them in the medium holes of a box grater. In a small jar with a tight-fitting lid or a blender, combine the olive oil, maple syrup, lemon zest, lemon juice, garlic, salt, and pepper. Shake to thoroughly combine.